At the end of last year both operators agreed a joint £500 million deal to deploy FTTH ultrafast broadband (here). Phase One of this scheme (the build phase has already begun) would seek to cover a “minimum” of 1 million homes in up to 12 of Cityfibre’s existing cities and towns, which according to Vodafone is expected to be “largely complete” by 2021. After Phase One there’s also the “potential to extend” this network up to 5 million homes (approximately 50 towns and cities, representing 20% of the current UK broadband market) by 2025, although that would require even more funding. Since then Cityfibre has announced that they’ve been acquired for £537.8m cash by Bidco and will be going private (here), which should resolve their future need for more investment. So far the partners have announced that Milton Keynes would be the first to benefit from this rollout at a cost of £40m, (here), which was followed by Aberdeen for another £40m (here) and Peterborough for at least £30m (here). Shortly after that Cityfibre added Edinburgh, Coventry, Huddersfield and Stirling to their plan (here), which at that point reflected a total investment so far of £315m and 500,000+ premises passed (here). 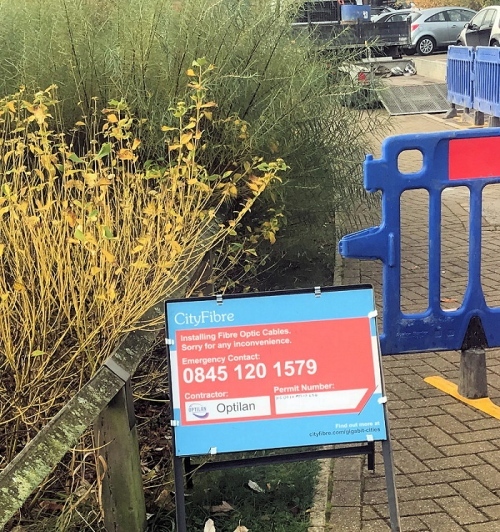 NOTE: Cityfibre already runs a significant Dark Fibre style network in each of these locations (normally used for serving public sector sites and businesses), which will form the foundation for their new residential service. Details of the available packages, which range in price from £23 per month for 100Mbps to £43 for 900Mbps, were released last month (here). Since mid-September 2018, hundreds of customers in Milton Keynes have already placed orders for the Vodafone Gigafast Broadband service, while residents and businesses in Aberdeen and Peterborough will be eligible for the service from early November 2018. Construction work is also set to start in Edinburgh, Stirling, Coventry and Huddersfield before the end of 2018. 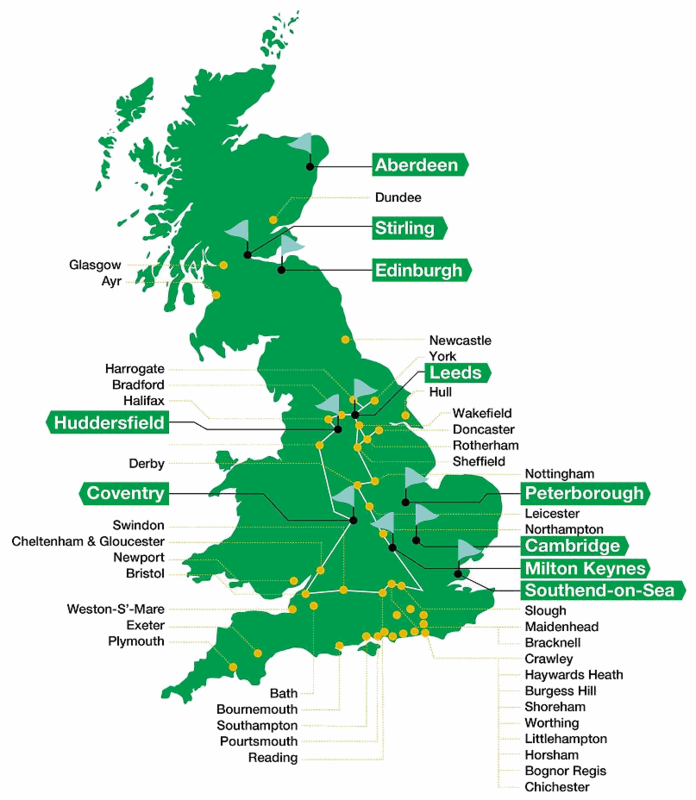 Meanwhile detailed city-wide planning has begun for Cambridge, Leeds and Southend-on-Sea, and Cityfibre is working closely with each local authority to co-ordinate the build and maximise the benefits of full fibre. We should point out that the new areas already have near universal coverage of “superfast broadband” (24Mbps+) networks via FTTC from Openreach (BT) and most can also access Virgin Media’s 350Mbps+ cable network. On top of that we note that there’s also a fair bit of ultrafast FTTP and G.fast available from Openreach in some of those areas, which is rising steadily. Such competition could put pressure on take-up, although Vodafone’s are clearing aiming to undercut those via their faster service speeds and some aggressive pricing. Great news for those locations. Really good to see some of the investment crystallising into deployments. Our street was supposed to be live already, but there are no signs of any deployment yet. We have had a couple of their sales people come round asking if we wanted fibre. They didn’t seem to be too familiar with the area as every house on our street has had FTTP from Openreach (original trial area) for 7-8 years now. AndyH – I assume this is in MK? Which area are you? I’m also on an Openreach FTTP connection in Monkston Park but awaiting the arrival of the CityFibre/VF service. BT’s pricing for any of the higher speeds is just way too high for me to consider but £38/month for 500Mbps symmetrical is brilliant. I haven’t seen any publicity about the MK roll out since the much herald first family goes live a couple of months ago. Nothing is being posted on the MKBag Yahoo pages either. It’s all gone very quiet. which trying a few Milton Keynes postcodes it appears it is live in more than a few areas. More FTTP the better. The Vodafone prices look aggressive. My only concern is that as they are commercial rollouts whether pockets of households may be bypassed and hence landlocked on legacy copper. That depends on wether the major operators are up to partnering with smaller operators who see ways to solves these islands. Ultimately once the network is close by the major operators are going to want to run as much through it as they can. But anyway more FTTP is better than less FTTP…..
Their problem is they’re struggling to get contractors to build this. They have trawled their build framework around the industry for a couple of years now making promises of work but couldn’t get the contractors rates down to their own estimates or got contractors to price several times but never placed orders so several contractors went to work on other telco FTTH builds. They’ve had to use subbies as main contractors to get them slowly going in the likes of Aberdeen and Milton Keynes. Southend also has an issue in that most of what was built to date there used Openreach infrastructure via DPA and was difficult to build when they could get contractors to work for them – know at least one contractor walked away. But their biggest problem is that most of their competitors including Openreach, Virgin Media and similar telcos such as Gigaclear and Hyperoptic have already got committed resource in a very resource tight industry several months or even years ago, CityFibre are going to have to make themselves very attractive e.g. top dollar rates, to get some momentum going in all these cities or Vodafone will soon be hitting them for late delivery of services and then the deck of cards will start to fall around them.